Instructor Sharon McAuley is pleased to offer two high intensity Interval training classes throughout the week both which focus on strength training and cardio conditioning. Our Trampoline HIIT class centres around the Reformer Trampoline. You’ll do intervals of high intensity cardio work on the Trampoline followed by short intervals of strength work. Take your endurance to the next level by “jumping” into this high energy class. Water and a towel are highly recommended. For additional information about this class please contact our studio coordinators. Please give a warm welcome to our new instructor Chris Csak! Chris has been In the Health and Fitness Industry for 20 years and has been teaching Pilates for 10. He has worked with a wide variety of individuals with varying goals and limitations both in Canada and abroad. He believes that by enhancing physical function an individual betters their physiological process and overall health. Having recently moved to Victoria, Chris is very excited to share his knowledge and experience with his new Community. Somatic Movement involves a series of specific exercises that reconnect the brain with the muscles so you can let go of tightness in the body. The movements are slow and mindful, and are preferably performed on the floor but can also be done sitting in a chair or standing up. The educator leading the class will verbally teach you the exercises rather than demonstrate, and you can feel free to close your eyes while you do the exercises. By not demonstrating the movements, we encourage an internal learning process. You can make changes in your nervous system more effectively and efficiently when you focus completely on your internal sensations rather than on copying someone else’s movements. No pain = more gain! Who is Somatic Movement Education for? you are or how fit you are. The classes also help to improve your Pilates, Yoga, Barre or other sports and your overall quality of movement. How will Somatic Movement Education help my pain? Somatic Movement addresses the root cause of WHY you are in pain and teaches you HOW to reverse it. When a muscle has been contracted over a long period of time, the brain accepts this as “normal” and doesn’t know it’s contracted – this is known as muscle sensory motor amnesia. You are in pain because the muscles are constantly over-contracted, causing them to be weak and tired. These contracted muscles can then compress the joints and trap nerves, causing further pain. Your body tries to compensate, changing the way you move and using other muscles instead, which sets up a further pattern of pain. The specific somatic movements “wake up” the brain to the reality of the contracted muscles, and retrain them to release and move in a more efficient and pain-free way! Once this happens, every day movements will seem much easier, you’ll be able to take up those hobbies that you had to put on hold because of pain and stiffness, and you’ll no longer have an excuse not to do your chores! You will be able to enjoy playing with the kids (or grandkids) and will achieve greater results in your sport and fitness training. You will look and feel younger as you move more freely. Compared to Yoga and Pilates Somatics is not considered so much a workout for your body but more for your brain. The movements provide a sensory feedback loop from the brain: you’ll teach your brain to notice when muscles are contracted, and then educate the muscles to fully release and work in a more energy-efficient and pain-free manner. If you cannot feel it you cannot change it! You have to be aware of your habitual patterns and contracted muscles first so you can actively change and release them. However, a Somatic Movement class is very relaxing for body and mind. You will leave with a sense of peace and a greater awareness of yourself. You’ll find that somatic movement will improve your Pilates or Yoga – you’ll be able to move deeper and further, and with greater ease. Read through blog posts from our fabulous instructors in our new Blog page under the whats new tab. Check back often! With a change in weather and the holiday season approaching, now is a great time of year to slow down and bring your attention to balancing the connection between your body and mind. When you wake in the morning remain in bed for a few moments to give yourself the opportunity to breathe mindfully and connect to your body. Keep your eyes closed and take a deep inhale through your nose, allowing your rib cage to expand to in all directions. Hold your breath for a few moments, then exhale through your mouth, focusing on engaging your abdominal muscles, drawing your navel in towards your spine to push the stale air out. As you take breath in focus on feeling air filling the sides and back of your body. Remembering that your core includes muscles in your waist and back, think about tightly squeezing the sides of your abdominals as well as the front as you exhale. After you are comfortable with your deep breathing and core engagement, take a mental scan of the rest of your body. Become aware of any sensations, pleasant or unpleasant, as you scan from the crown of your head down to your toes. Remembering that your thoughts have a physical effect on your body, use your final relaxed moments to intentionally bring a positive mantra for you day into your mind and repeat it several times. Building awareness of your core will give you better posture and balance throughout your day to come and will help you improve your performance in your Pilates & Yoga classes. Your deep focused breathing will oxygenate your blood, increase overall circulation ensuring that enough oxygen is flowing to the muscles you are using, and help to prevent unnecessary tension in the day to come. Have you noticed how animals always stretch after they wake up? If you have a pet you might see this around your home daily. Your pet might flex their back and extend their legs before they begin to walk around after sleeping. Complete this practice with some gentle stretching and movement. Hug your knees into your chest, perhaps twist side to side. Your mind might be awake, but make sure your body is too before rolling out of bed and engaging the day with a clear, positive, and relaxed mind. 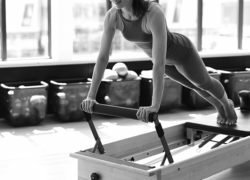 Athletic conditioning on the reformer will help you to sharpen agility, boost strength and endurance and prevent injury. Our instructors will educate you on how to isolate muscles and increase movement efficiency while emphasizing core stability in a sport-specific Reformer-based workout. This class is now being offered Saturdays at 8am with Pilates instructor Sharon.